Even though it’s Friday, it’s a Friday in February, which can be a bit off-putting. The weather, the early evenings, the economy… It is all enough to throw a wet blanket on the best of days. Nope, we need cheering up. With the impending Academy Awards, my thoughts turn to that other great opiate of the masses: the pictures. The problem is that I prefer movies that are less likely to be nominated for an award. Nothing too dark, nothing too soul searching, nothing with too much of a message. No daemon hunter am I; there are too many that pop up day-to-day to go looking for more. P.G.Wodehouse, or Plum as he was known (see the tie in to my post title? ), was considered by his peers as one of the finest writers of his generation. He is, today, a classic of his genre who reached the height of his craft with the stories of the “wastrel” Bertram J. Wilberforce Wooster and his gentleman’s gentleman of prodigious brain, Jeeves. The best portrayal of these two perfect specimens is by Hugh Laurie (yes, “House, M.D.”) and Stephen Fry. Watch it for the wonderful country house settings, the art deco architecture, the costuming (perfection — there is a lot to learn here), the dialogue (“Aunt bellowing to aunt, like Mastodons across the primeval swamp…”) or the camaraderie (the two have known each other since University and had a comedy show prior to J&W. They work very well together and it shows.) Whatever your reason, watch it as soon as possible. And laugh your way through our less complicated lives. This entry was posted in Elegantology and tagged Hugh Laurie, Jeeves and Wooster, P.G. Wodehouse, Stephen Fry, The Academy Awards. Bookmark the permalink. laughter is alway the best medicine. And one of the most stylish titles/theme music sequences in television history. Perfect choice! I love Wodehouse and I love this perfect rendition of his stories. By the way, both Laurie and Fry have written very funny novels too. One of my all time favorites and a perfect pick for a February weekend. Laugh out loud funny and I agree Bertie’s clothes are a long lost glory. -“Rosemary & Thyme” mystery series — gorgeous homes and gardens and fun stories too! Great post, great suggestion! Bertie and Jeeves are tops at our house! 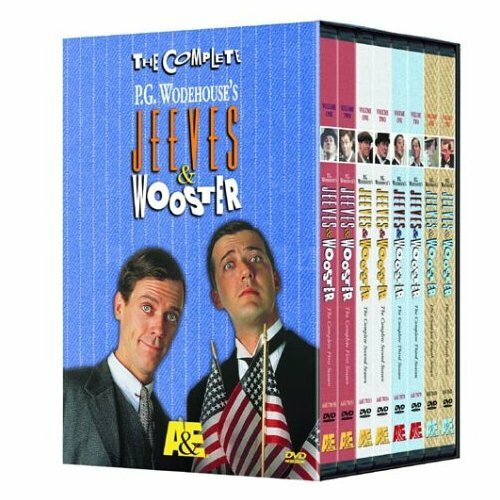 When our son packed for college, he took our Jeeves movies! So we bought a second set. We also love the 7-hour pubic television version of Pride and Prejudice, Anne of Green Gables, and the early, old Miss Marples (also mentioned above). Off to NetFlix. Thanks Jan! And I probably should add that I loved the Poirot and Foyle’s War series so much that we now own them. Ah…I remember when the series first aired on PBS….I HAD to be home to watch it. I remember landing in Newark early one Sunday evening and driving like a wild man out of the Avis lot in order to get to my hotel in time to see that week’s episode. Funny enough, I also remember what I wore the next day. Polo double breasted olive drab suit…a winter weight but not flannel…kind of a heavy serge…with a chocolate brown windowpane that would rival the Duke of Windsor’s windowpane wearing aplomb…and of course…brown suede shoes. I was channelling Bertie. I would also suggest A House of Cards starring Ian Richardson ….not as picturesque an era as the Jeeves/Wooster stuff but still a great series. “You may think that, ADG. But I could never say it….” Got that one, too. Now I am channeling on the ‘remembering what I wore when I was (wherever),’ and think this could be a theme for a book! For those of us that are very tuned into the subtleties and aesthetics in life more than the factual content . . . well, I can remember what I wore to kindergarten; I remember a fabulous madras plaid shift my mom sewed for me that I wore in 4th grade (1962); I remember what I wore on my husband and my first date (yes, 26 years ago), etc. I know most of your readers also remember these things. It’s wonderful when one can close their eyes and visualize a great wardrobe moment. I am am the same with scent and fragrance. My husband just piped in and tells me there is indeed a book about this, “Love, Loss, and What I Wore” by Ilene Beckerman. It is a highly regarded book which neither of us has read. Oh, I do so love these! The names of all the characters are just so perfect. We just found a new BBC series that we love. Witty and beautifully photographed. It’s Doc Martin. You might want to check it out. Enjoy the Oscars. I’m still trying to decide what to wear! If you enjoyed the 1920s and the art deco style, may I recommend “Poirot” by David Suchet. He starred as the eponymous Agatha Christie’s Poirot in the TV series. If you type “Jeeves and Wooster” in the iTunes search bar, the title theme for the show will appear on a CD called “Transatlantique” by Graham Dalby and the Grahamophones. You can also make a ringtone of it for your phone. I confess after all these years that tune is the one I remember best.